ready to try something new in january? We are all guilty of getting stuck in a food rut from time to time. With everything else that fills up our days, there can be comfort in not having to think too hard about the ingredients we need to make a easy, tasty meal for ourselves and our families. At Go Natural Foods, we see so many great new products and tasty nutritious alternatives to the kitchen staples, that it can even be hard for us to figure out what product to try first and how we could use them. If you love butter (and who doesn’t? ), ghee is like 3 steps forward in the deliciousness scale. It is made from butter that is melted then left to separate so the milk solids can be skimmed off to leave pure liquid gold (ghee). It is literally all the best parts of butter with very minimal traces of lactose and casein. Extremely rich in vitamins E, A and K as well as essential fatty acids to support brain function, ghee is a life force of nutrition. It has a very high smoke point so is more suitable than butter for high temperature frying. You can also use it for roasting, sauteing, stir frying. You could even just spread it on toast. The rich, caramel taste of ghee enhances the flavour of all foods it is cooked with. Trust me! Coconut products are taking over like wild fire and for good reason. Not only are they a taste sensation, they’re excellent for those with allergies or intolerances, and provide an array of nutritional benefits. Coconut amino sauce is a tasty soy sauce alternative made from fermented coconut sap. As its name suggests, it’s rich in over 17 amino acids which are the building blocks of our muscular system. 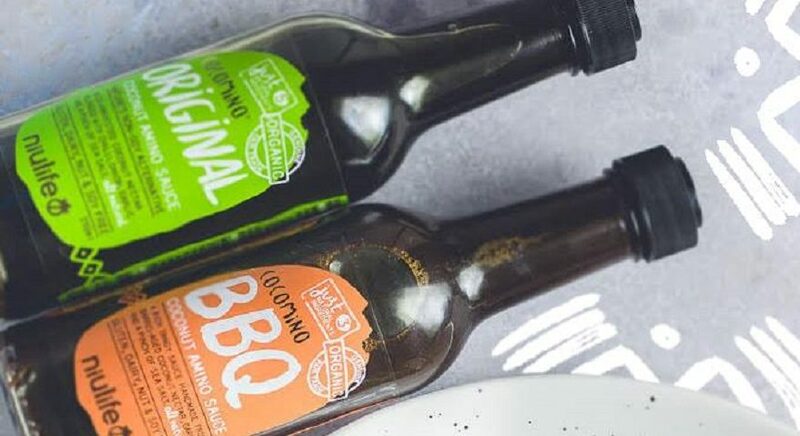 For rich umami flavour (aka awesome savouriness) add it to salad dressings, stir-fries, marinades, soups, stews and dipping sauces..the possibilities are endless. Every Mite is a delicious tasting spread, not dissimilar to vegemite with a slightly sweeter flavour and no hidden nasties. Made from a base of Certified Organic black sesame seeds (rich in calcium) with coconut aminos, Himalayan salt and gut friendly apple cider vinegar, it is gluten, yeast and dairy free with no grain, nut or egg derivatives. Delicious on toast (with smashed avocado..yum! ), in soups or casseroles, or even in a cup of hot water as a broth style alternative. Nutritional yeast flakes could be one of the best new additions to your diet in terms of flavour, versatility and nutrition. Often known as a ‘vegan’ cheese alternative, these tasty flakes should in no way be restricted to non-meat eaters only. They are most often made from blackstrap molasses where they are grown, harvested, washed then dried to deactivate the active yeast component. This means they are perfectly suitable for those who must normally avoid yeast products. Nutritional yeast flakes are best known for their tangy, cheesy flavour making a tasty addition to lasagne, quiches, popcorn, noodle dishes, roasted vegetables and more. They are very rich in B vitamins and are also a complete protein, making them a very popular meat and dairy alternative for all. We know wheat noodles are a number one comfort food for many people but can often exacerbate digestive issues and skin allergies thanks to gluten overload. Enter kelp noodles, a clear, tasteless noodle alternative made from brown seaweed that is virtually fat free, low in carbohydrates and high in fibre. Kelp noodles are also gluten free and rich in calcium, iodine, iron and vitamin K. The best part is their neutral flavour and light, springy texture means they can be paired with any sauce, soup or salad to create a delicious low calorie alternative to conventional pasta. Which new food will you try first?